Hope you had a great Easter weekend. I am still recovering from it :D:D Today I would be sharing new launches from Real Techniques and Eco Tools. Both brands have amazing beauty tools and this time its is a sponge and a brush! These products are quite innovative and each has such unique uses, you dont wanna miss this post! This sponge is made with Konjac fibers and is designed to cleanse skin gently. I was most intrigued by this because I have used cellulose sponges in the past to cleanse my skin but this had a unique shape - quite similar to the makeup sponge I use. I like that it is tapered and has a pointy tip which helps reach contours of the face nicely. This sponge is very hard when dry but softens as I hold it under running water. It gets a bit bigger in size too. I apply my cleanser or facewash on the sponge and gently massage it all over my face. It exfoliates, cleanses and also removes makeup. It doesn't feel scratchy or hard against the skin. Its really an amazing product and only for CAD$11.99! Its available in another variant for deep cleansing too, that contains bamboo charcoal along with the Konjac fibres! You can find these products on FarleyCo's website. 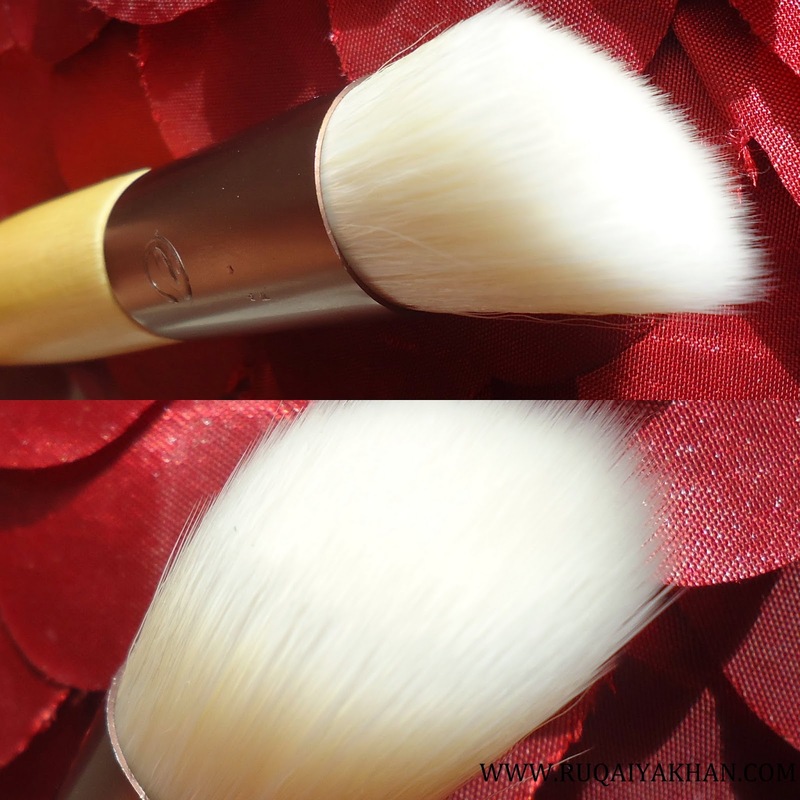 Finally, I have a brush designed for my most favorite makeup product - my BB creams! I love using BB and CC creams and this brush is soft and dense to work nicely with the creamy texture of BB cream. I can actually use this for my foundation too, however, I feel it soaks up my liquid foundation, so better to use it with mousse or creme foundation or stick to BB cream and CC creams alone. Love the shape of this brush. It did not shed on my skin. It stayed well after washes and dries within a few hours! So, I am enjoying this new brush from Eco Tools! These are the two new products from Real Techniques and both are under 10 dollars! Isn't that awesome? Lets find out more. When I first saw the Silicone Liner Brush, I actually laughed at it. I would've never imagined, doing my liner can be this easy! And I have been using eye liners for almost a decade now! This brush is genius! It has a silicone tip that easily flexes according to your hand movement and the shape of the eye - which really helps in evenly applying creme or gel liner. I have always used the liner brush with bristles and also a small angled brush to line my eyes, but nothing makes it easier than this guy! This brush is such a time saver. I just dip it in the liner pot, line my eyes and wipe the tip off with a kleenex and I am done. It does not absorb/pick too much product from the pot and I rarely find myself scrapping it off the edge of the gel liner pot. Hope you enjoyed this post and all the new and innovative products I shared. You can purchase Real Techniques and Eco Tools products from FarleyCo Beauty and also from several retail locations across Canada. The BB Cream brush looks SO good! I love using BB Creams too and it would be nice not having to get fingers dirty.